Not to be confused with Marc May. Mark Eric May (born November 2, 1959) is a former American college and professional football player who was an offensive lineman in the National Football League (NFL) for 13 seasons during the 1980s and 1990s. May played college football for the University of Pittsburgh and earned All-American honors. He was selected in the first round of the 1981 NFL Draft, and played professionally for the Washington Redskins, San Diego Chargers, and Phoenix Cardinals. He is currently a football analyst for ESPN. 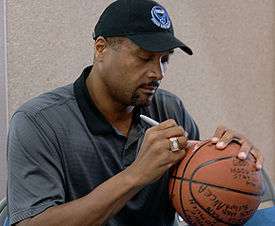 May attended the University of Pittsburgh, where he played for the Pittsburgh Panthers football team from 1977 to 1980. As a senior in 1980, he was a consensus first-team All-American and received the Outland Trophy as the nation's top collegiate interior lineman. As a part of the 1980 Pittsburgh Panthers football team, he played with future NFL players Dan Marino, Jimbo Covert, Bill Maas, Hugh Green, and Tim Lewis. As a junior and a senior, May did not allow even one quarterback sack. He earned the nickname "May Day" for "wreaking havoc on the opposing defensive ends." After his senior season, May played in the Hula Bowl and Japan Bowl all-star games. ↑ "The Oneonta High School Athletic Hall of Fame / Wall of Distinction". ↑ "May Reported as Outland Winner". ↑ "May's Day Finally Comes". ↑ "Pitt To Honor Mark May and The 1980 Panthers At Homecoming This Weekend". ↑ "Sports of all sorts". ↑ "Redskins may leave May, Grimm unprotected". ↑ Smith, Timothy W. (June 19, 1992). "FOOTBALL; Juror Is Dismissed From N.F.L. Antitrust Suit". The New York Times. ↑ Simers, T.J. (September 20, 1991). "For Chargers' May, Might Makes It Right". Los Angeles Times. ↑ "Mark May's Tales from the Washington Redskins". 1 2 3 "Mark May". ↑ "Turner Sports - NFL on TNT". CNN. ↑ "Football Player From Pitt Held In Riot Charge". The Pittsburgh Press. January 29, 1979. Retrieved October 15, 2014. ↑ "Pitt's May Arrested". Pittsburgh Post-Gazette. January 29, 1979. Retrieved July 15, 2013. ↑ United Press International (February 15, 1979). "Pitt's Mark May receives $150 fine". Beaver County Times. Retrieved July 15, 2013.